Oh, how the 2011-12 NHL season has flown by. It seems like only yesterday that everyone was throwing around their picks on who would make the playoffs, arguing whether teams like the Ducks could contend in the Pacific and if Columbus’ off-season moves made them playoff contenders. Now, with the season nearing its completion on Saturday and so many sets of predictions looking like some lost relics from an era where no one had a brain between their ears, NHL pundits are gearing up once again for the next big thing in predictions: the awards season. Granted, the awards won’t be handed out until the NHL Awards show in Las Vegas on June 20th, but with ballots going out and scribes furiously hashing out who they want to vote for, the season for prognostication is in full swing. Out of all of the awards to be handed out this season, there perhaps isn’t a bigger debate than the one swirling around who should win the Vezina Trophy. Voted on by the 30 GM’s in the NHL, this award is usually a pretty simple one to handicap, but with so many goalies having great seasons this year, the competition just for a spot among the three finalists is going to be fierce. So who has the upper hand in this competition? Here is a look at the most likely contenders for one of those three spots, along with a prediction on who will take home the hardware from Sin City. Elliott is a guy who seemingly came out of nowhere this season to help guide the Blues back from obscurity and into the thick of the race for the President’s Trophy. He is sporting the league’s best Goals Against Average (GAA) at 1.48, and also the best save percentage in the league at .943%. Add to that his second-best nine shutouts, and you have a guy who should be a runaway favorite. Right? Wrong. Elliott’s biggest downfall is the limited number of games he has played in. Yes, he has all of those ridiculous stats, but he has only played in 36 games this year, and despite his excellent play he has been unable to shake Jaroslav Halak from the crease for more than limited spurts. In a league where iron horse goalies are often rewarded, Elliott just doesn’t quite have the mileage to be considered a shoe-in for the trophy. 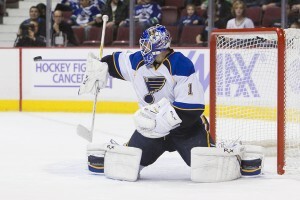 If we are going to discuss Elliott, we have to discuss his fellow crease-minder Halak. Halak came into St. Louis with huge expectations, and while he didn’t live up to those last year, he has more than made up for it this year. In 45 games, Halak has a 1.97 GAA (5th in the league) and a .925 save percentage (6th). He has done what many would have thought impossible, and that’s preventing Elliott from grabbing the reins full-time. Unfortunately for Halak, he falls into the same trap that Elliott does, and that’s just the fact that he hasn’t played in enough games to make him a runaway favorite. His stats are excellent, but voters won’t take a guy who has barely played in half of his team’s games. Howard is an interesting case, because he inspires both a lot of love and a lot of hate from his fans in Detroit. On the love side of the column, he has had a stellar year statistically for a team that put together an incredible home winning streak. He is sporting a 2.14 GAA (6th) and a .920 save percentage (12th). Put together and taking into account the injuries Detroit has had to deal with, it’s a pretty solid resume. Unfortunately for Jimmy, he has dealt with some inconsistency this season, and that might play into the minds of voters when casting their ballots. He has also cooled considerably since a hot start to the season, and when added to the discrediting a lot of Detroit goalies get from playing for the Red Wings, he has a lot of obstacles to overcome to be considered a major contender. Lundqvist has been one of, if not the, biggest stories in the NHL all season long. Frequently mentioned as even a Hart Trophy (MVP) contender, Lundqvist has helped guide the Rangers to the top seed in the Eastern Conference behind his 1.93 GAA (3rd) and his .931 save percentage (3rd). Add in his eight shutouts and presence in a major media market like New York, and you can easily see why he’s considered a favorite for the Vezina. About the only thing that could work against Lundqvist is the fact that he plays for such a good team. They are a gritty bunch that puts a lot of emphasis on defense, and they score plenty of goals (11th in the league with 223) so that Lundqvist isn’t playing in a high-pressure environment. Those are minor quibbles, but that’s about all you can say about his candidacy. Speaking of big stories, the next great American hope in net has to be Quick. Relegated to third string duty behind Ryan Miller and Tim Thomas in Vancouver in 2010, Quick has proven this year why he’s the future for the Stars and Stripes. 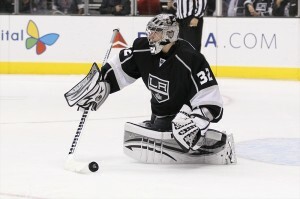 He has the most shutouts in the league with 10, a sparkling 1.89 GAA (2nd) and a .931 save percentage (2nd). When you consider that he has played 31 more games than Elliott and that is the only guy ahead of him in both categories, you realize how special his year has been. There really is only one thing working against Jonathan, and that is the fact that he plays on the West Coast. Like it or not, the vast majority of NHL clubs are based in the East, so a lot of the GM’s may not have watched him play enough to fully appreciate the season he is having in the City of Angels. After signing a rich extension in November, there was debate in Punditville as to whether or not Rinne should command such a high salary. This season, he has proven that he is likely worth that $7 million a year deal. He is carrying a respectable 2.43 GAA and a .922 save percentage despite playing in 71 games for his team, who is still fighting for home-ice advantage in round one of the playoffs. The big downsides to Rinne’s candidacy are two-fold. The first is that his stats really aren’t that good when compared to some of the other big contenders for the award, and the second and more difficult of the two to overcome is that his success could be argued stems more from the defensive system that Nashville employs than his own abilities. Having Shea Weber and Ryan Suter as teammates may be a good thing on the ice, but when it comes to awards, it could very well be a hinderance. Replacing Ilya Bryzgalov in the desert may have seemed like a tall order, what with writers questioning how he could possibly fill those skates, but Smith has done that and more this season. He is sporting a 2.25 GAA and a .929 save percentage in 65 games this season, but perhaps what’s most critical to his candidacy is that he has racked up three straight shutouts as his team has fought for a wild card spot in the playoffs down the stretch. Working against Smith are two tired melodies: the “market” argument and the “system” argument. Phoenix is obviously not one of the biggest markets in the league, so he may not have had enough exposure in terms of GM’s watching him play. In addition, the Coyotes and Dave Tippett have a gritty-defense-first strategy that they employ, so he may be dismissed as a system goalie by some. Finally, we have the defending Vezina winner Thomas. There was likely a ton of pressure on him to repeat his performance of a season ago, and he has largely done a good job. He has a 2.36 GAA and a save percentage of .921%, and he has helped the Bruins through the tough stretch that they have been without a quality backup in Tuukka Rask. Thomas does have a few obstacles to his candidacy, namely that his stats aren’t quite as good as some of the other main contenders, and also the fact that Boston has scuffled in several spots over the course of their reign as defending champions. Thomas obviously isn’t solely to blame for that, but that may be taken into consideration by voters. If someone had made an argument that Quick would knock off Lundqvist to win this award even a month ago, they would have been laughed off the stage of public discourse. Quick has turned skeptics into believers this season, however, and his play is the main reason why the Kings are even in the playoff chase. Yes, they did make some smart moves in getting Mike Richards and Jeff Carter, but when push came to shove, it was that guy between the pipes who has gotten it done for the Kings, and that’s why he deserves this award.